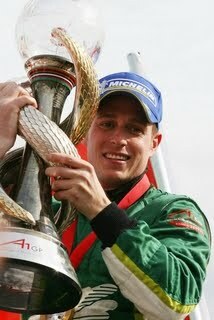 Second in Formula 3 Britain 2004. Third in Masters of Formula 3 2004. European Formula 3 Cup champion 2004. British Formula 3 National class champion 2002. Third in Formula Ford Festival 2001. British Formula Ford Winter Series champion 2000. '08/'09 A1GP champ...hmm. Sprinkle in some GP2, varying experience in other European formulas, and F1 testing for BAR-Honda, and we just might have something here. Intrigued? Check out Adam's full bio here. So... new country, new series, new track, new team: how will Carroll fare against TK, RHR, DP, and MA? Hard to estimate, but that's not going to stop us from speculating. Check out the poll above, and voice your opinion on how things will shake out for AA at Watkins Glen. BTW: Don't miss the showdown next Sunday—with so many road-racing superstars in the IZOD IndyCar Series, I think we’ll be celebrating the Fourth with a bang.